“I have so much power just in my voice. I keep saying the word and they’ll be bankrupt.” POTUS explaining his revenge against news outlets. 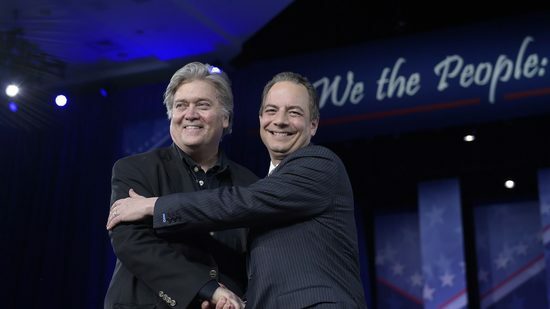 Kumbaya in the bunker …Steve Bannon and Reince Priebus appeared in a joint interview at the annual Conservative Political Action Conference (CPAC) outside Washington, D.C. and the former provided a glimpse of the crypto-fascist mentality that informs POTUS45* and his White House. It was quite unlike the pageant queen’s interview segment where “world peace” was the main goal for a winner or her runner-up. Lord Dampnut is now clearly a cipher for Bannon’s Fourth Turning / Clash of Civilizations mania and functions as the national CEO in between rounds of golf. POTUS45* is Bannon’s alternative, alt-fact, media factotum, available to cut the ribbon at the launching of any car dealership. President Bannon’s racist minarchy aims to forward an American version of the “End of Times” in Alexandr Dugin’s Fourth Political Theory. Crony capitalism and kleptocracy will benefit from the chaos and catastrophies that result from implementing those theories. Bannonist nationalism privileges one ethnicity over all others and is based on an anti-scientific ignorance based on primitive supremacy of the sort promulgated by neo-fascist political parties. It specifies a permanent war between Dominionist and Islamic caliphates. 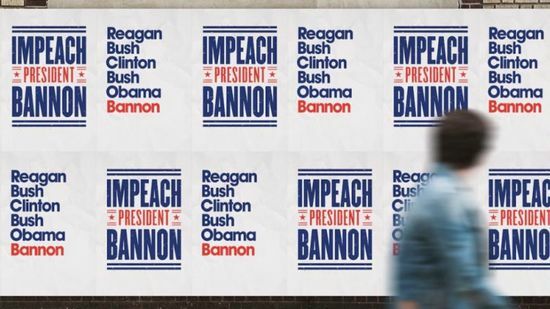 Bannonism projects a similar economic model of racial conflict onto nationalist trade wars which oversimplifies bilateralism in order to benefit ruling class wealth. It does so at the cost of social welfare that would be more optimal under multilateralism. Advantage is never comparative. The result of destroying rather than deconstructing the administrative state is designed to profit from its destruction while advancing the goals of (ad)venture capitalist warlords. It is Malthusianism complete with prepper bunkers. This is less creative destruction than a misanthropic chaos designed to return the global economy to some infomercialized feudalism. Bannonism’s fatal flaw lies in misunderstanding the political goals of deconstruction and enslaving it to a totalized discourse of racial superiority, resembling some defeated historical models. 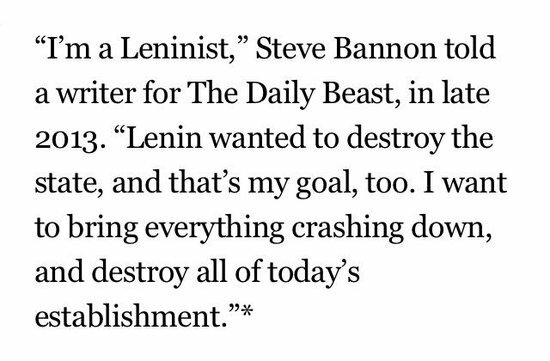 Since his goal is short-term capitalist profit, Bitcoin is even more of a deconstructive economic program than what Bannon wants to achieve, making his prescriptions in their reified form, crypto-fascist in its goals. It’s not deconstruction as much as it is appropriating institutions, aided by demolishing (via deregulation) their income-distributional mechanisms for greater class wealth resulting in greater inequality. With undeconstructed profit it’s like starting a riot to disguise a bank robbery. Corporations will survive the deconstruction, so it’s no deconstruction as it is re-centralizing the administrative state for totalitarian control. 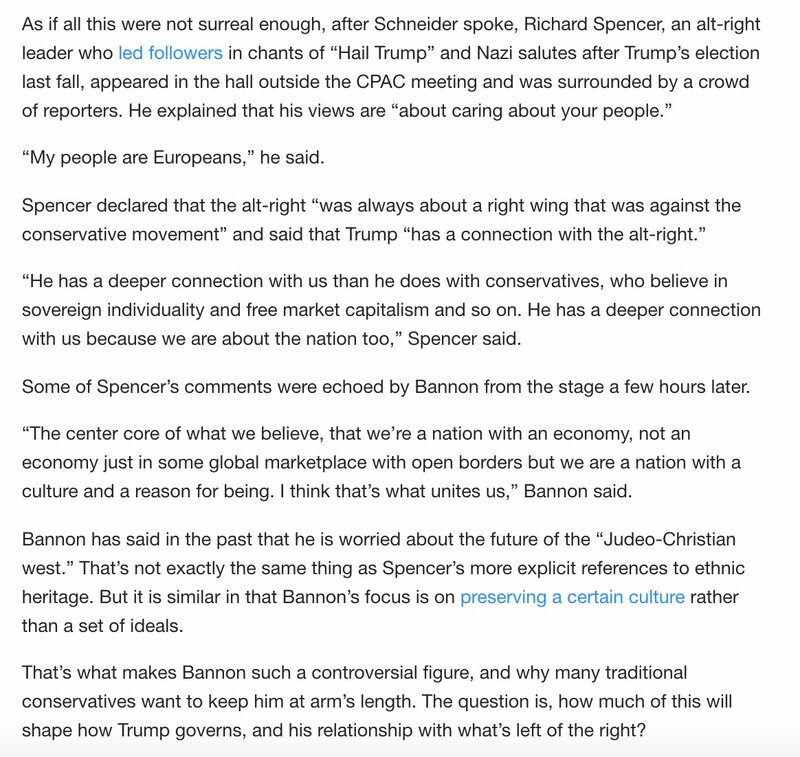 More interesting will be the first RW pundit to denounce Bannon as a “Cultural Marxist” precisely because he has adopted a “deconstructive” position on the administrative state that cops a cue from the Frankfurt School. 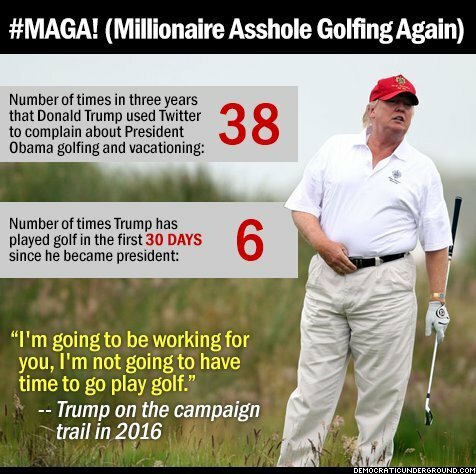 Lord Dampnut, his junk food, and nuclear trigger are on a perpetual golf vacation punctuated by ceremonial moments celebrated by mass media but with little relevance to the diminution of public policy and in favor of the privatizing the greater good. But tensions were clear as Dan Schneider, leader of the American Conservative Union, took the stage to denounce the “alt-right”, the rebranding of the far right that has been accused of racism, Islamophobia and neo-Nazism. “There is a sinister organization that is trying to worm its way into our ranks and we must not be duped,” he told the audience. 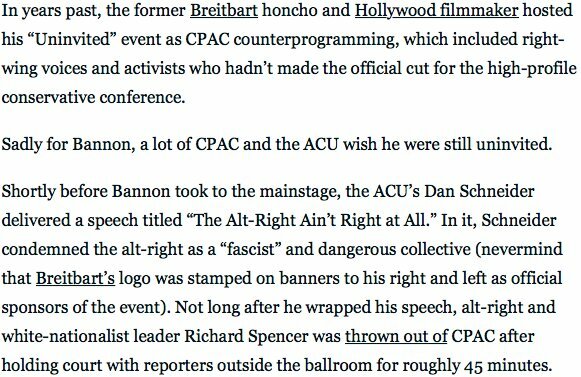 A short distance away, outside the main hall, the prominent white nationalist Richard Spencer, wearing a general admission badge, told reporters that he “coined the term” alt-right and rejected Schneider’s criticism. STEVE BANNON: And Matt, I want to thank you for finally inviting me to CPAC. …BANNON: But — but — I think — let’s go back to the point that Reince made for a second. President Trump, when he was running, he made a — and this is the other thing that the — the mainstream media or opposition party never caught is that if you want to see the Trump agenda it’s very simple. BANNON: I think the — I think the same thing; I think if you look at the lines of work, I kind of break it up into three verticals of three buckets. The first is kind of national security and sovereignty and that’s your intelligence, the Defense Department, Homeland Security. BANNON: You know, I’ve said that there’s a new political order that’s being formed out of this. And it’s still being formed. But if you look at the wide degree of opinions in this room — we have wide and sometimes divergent opinions. 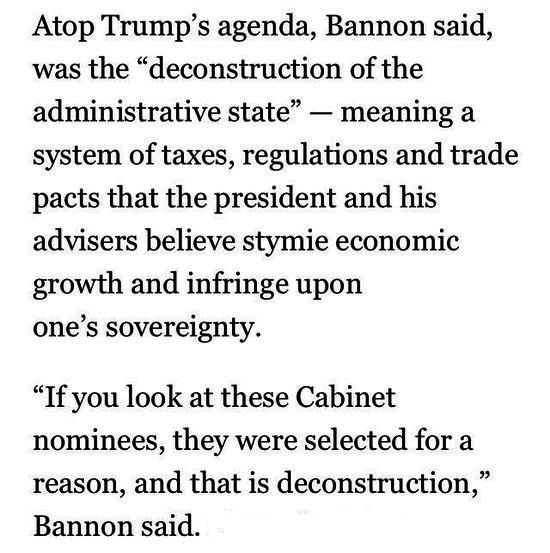 Bannon’s use of “deconstruction” is meant to impress Spencer without the usual punch in the head, when its application in this context is meant simply as negation whereupon smashing the American administrative state would be amusing if that was the actual goal, Leninist or not. In Bannonism it is more structural in the sense of gaining capitalist value / building wealth which, as crony kleptocracy is more revisionist than radical in objective, hence it is less deconstruction and more demolition in the service of deregulatory profit — for each DeVos and Perry you have Goldman Sachs and Exxon/Mobil. (Thomassen, 2010) As I have tried to argue, a deconstruction is an intervention and does not leave its object intact, nor is deconstruction itself left intact by its particular uses. Rather, deconstruction is rearticulated each time it is used; it “is” through its particular uses, and it can always be put to new uses,so what it “is” is never stable. We should think of deconstruction in terms of rearticulation. It is not a set of procedures or techniques to be applied, as if it were a given method applied to an object from the outside. Rather, we are dealing with a relation of rearticulation, where deconstruction as a method is not given prior to its particular uses. Or, if we were to use the term application,we would have to say that it is aporetic: on one hand, deconstruction cannot be applied because it is not given as a method prior to its applications; on the other hand, deconstruction can only be applied because it only exists through its particular applications, and does not exist independently of these (Derrida 1996, 218).4 The relationship between deconstruction as a theory or method and its particular uses is one of both exteriority and interiority. On the one hand, each use of deconstruction cannot simply be subsumed under an existing definition of deconstruction; on the other hand, “each deconstructive ‘event’ remains singular” (Derrida 2008, 4) and redefines what deconstruction is. Something analogous goes for the relationship between deconstruction as theory and method and its particular applications. Deconstruction as theory/method is not left intact by its application to a particular case or issue. Rather, the application rearticulates the theory/method,among other things because it helps us see limitations in the theory or method and develop new theoretical and methodological insights. 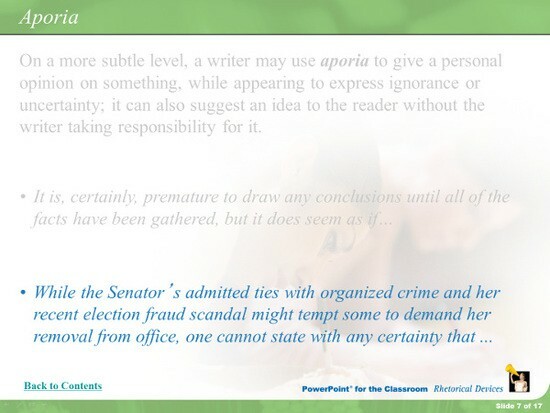 Nor is the case left intact, because the deconstructive analysis of it shows the undecidabilities and aporias in the discourses under analysis. This entry was posted in 2016 Election, American History, Economics, Fascism, Fascists/Corporatists, Government, Government Propaganda, Immigrants, Media, Organized Crime, Political Science, Politics, Presidential Elections, Presidents, Propaganda, Society, United States and tagged bannon, deconstruction, Donald Trump, Media, Politics. Bookmark the permalink. Those Russian flags with the Great Orange Plague name on them was the most epic trolling in recent memory. If trolling was an Olympic event, that is Olympic Gold Medal worthy. World class trolling at its best. That also demonstrates the abysmal ignorance of conservatives who were so stupid and ignorant that they did not catch the point. That photo is priceless and validates most folks knowledge that those Trump and GOPers are ignorant fools. I nearly sprained myself the first time I saw the picture. Wonder if any of those folks would be interested in the fine beachfront property in Wyoming I can sell them? Is Alec Baldwin busy for the night? 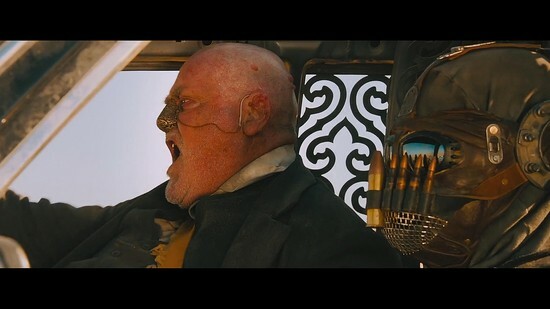 Also, Melissa McCarthy. You can’t go to a correspondent’s shindig without your press secretary! His Orangeness does not drink and and hates guys with facial hair. What in the hell does Bannon have on him that he gets to hang around and have so much power over the inner sanctum? That picture reminds me of myself, back when I was a kid. There must be something that keeps him close, there is a great loyalty to Bannon, and a lot of power to hold him so close in spite of the drinking and shagginess. A neat freak and a slob: looks like the :Odd Couple” to me. I can’t decide if Bannon needs one of those showers trump is famous for or if he just got one. A suggestion for cutting out the middleman. 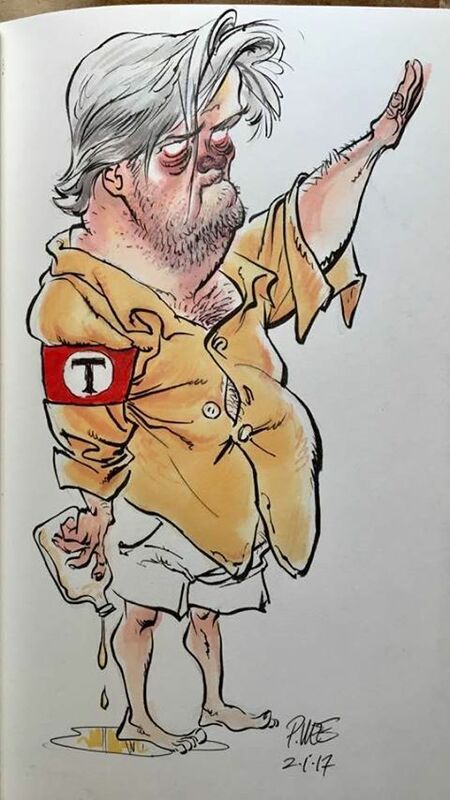 Jack Daniels could simply send a tanker truck, park it in the Wast Wing parking lot, and run a hose into Bannon’s office..
Perhaps they could could just drain the pool and fill it with ol’ No. 7. Waste of good whiskey though….. I am afraid to know what the reason is that Bannon has this hold on Trump! 18 U.S. Code § 2252 ????? Or perhaps 18 U.S. Code § 2251 ???? Had to look that one up. Could be Bannon prefers vodka to Jack Daniels.